There are two main uses for a master cylinder in automotive applications. They are generally used with braking systems and clutch systems. This article will discuss their role in braking systems, but most of what I have written also applies to their use with clutch systems as well. Let's take a look at what exactly these parts do and what to do if you suspect they might be going bad. What is a Master Cylinder on a Car? What is a master cylinder and what does it do? It is an integral part of a braking system that is used to transfer energy or power from the brake pedal to the brake pads and shoes in order to safely stop the vehicle. Your brake pedal is connected to the brake master cylinder. When you step on the pedal, a small rod is pushed into it. This pushes on a piston inside a bore (hole) in the cylinder. This piston pushes brake fluid out from the reservoir through the brake lines and causes the caliper piston to extend outward and push the brake pads against the rotor with enough force that it slows the vehicle. The process converts mechanical energy to hydraulic energy which is then transferred back to mechanical energy. This might seem confusing at first, but it really is a great way to get the energy of your foot against the brake pedal down to the brake pads and rotors. When cars were first invented they used a purely mechanical braking system. This system needed to be adjusted constantly, had to have parts replaced all the time and was generally not very reliable. However, even though the purely mechanical system was a pain to use we still do use a form of it in modern cars. The parking brake system is a mechanical system designed to be used in the event of a hydraulic failure. 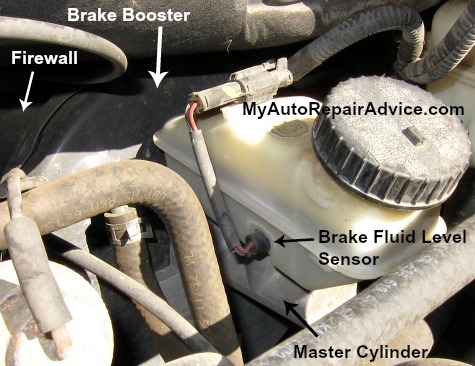 If you notice clear fluid leaking from around where the cylinder bolts to the brake booster or inside the vehicle where the brake pedal pushes into the brake booster, then you likely have a cylinder leak. Inside the cylinder there are rubber seals that get worn out. As this happens they tend to start leaking brake fluid out. If you turn off your car or truck and push on the brake pedal it should get very hard. If you keep pushing on it lightly and it keeps sinking to the floor that is an indicator that the cylinder is leaking internally. The only good way to fix this problem is to replace it. Sometimes you can find seal kits that have all the parts you need to rebuild it, but you shouldn't attempt this unless you're very confident that you can get it right. If you have recently found brake fluid in your reservoir that had water in it or was very dark in color then you could have a problem with your cylinder. This type of brake fluid can eat away the rubber seals inside the cylinder and cause it to start leaking. If you or your mechanic has determined that your brake master cylinder is bad, most of the time the only option is to replace it with a new one. Many times you can get a cheaper one by buying a rebuilt unit. These are usually a good deal because they have had all the seals replaced. The seals are what cause them to go bad 90% of the time so as long as those have been fixed it should be a good part. You can also sometimes get a repair or rebuild kit for your cylinder. These can be hard to replace for DIY mechanics so it might be best to leave this to your mechanic.